PLEASE, PLEASE, I WANT ONE! While dogs make great companions and friends, they require a level of responsibility that not everyone can achieve. Goldens, in particular, crave human attention and companionship. Constantly keeping them tied in the yard, or locked in a basement or garage due to behavior or housebreaking problems, is not responsible care. So, take the test and see if you can answer yes to all of the questions . . . to see if you're ready for a Golden family member. 1. Have you read about the history of the Golden Retriever? 2. Do you know the desired characteristics of Goldens? 3. Do the characteristics of Goldens fit into your life style? 4. Does the Golden Retriever's high activity level match yours? 5. Do you have the necessary supplies for a new puppy, such as food & water dishes, food, a crate, collar, leash, comb and brush, etc. 6. Have you considered the cost in time and money to provide health care, food, and training for a puppy? 7. Will you make an appointment with a veterinarian for a health examination, shots, and worming if needed? with your puppy until he/she is old enough for classes? social animals, your puppy will not want to be alone. Expect your pup to whine, cry, and/or bark when you leave for school or for work. pup protests being alone, he may annoy your neighbors even if he doesn't bother you, causing problems. ARE YOU PREPARED TO . . .
11. Take full responsibility for this dog and all its needs for the next 10-15 years? This is NOT a task that can be left to children! 13. Always keep the dog safe; no running loose, riding in the back of an open pick-up truck or being chained outside? 15. 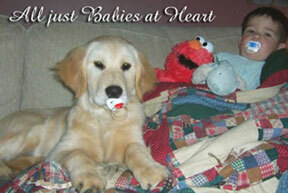 Live with shedding, retrieving, drooling & high activity for the next 10 to 15 years? preventative, spaying or neutering and annual check ups? 17. Keep the breeder informed & up to date on the dog's accomplishments & any problems that may arise? 18. Take your questions to the breeder or other appropriate professional before they become problems that are out of hand? 19. Have the patience to accept (and enjoy) the trials of Golden puppyhood (which can last for 3+ years) and each stage afterward? 21. Resist impulse buying and instead have the patience to make a responsible choice? 22. Become EDUCATED about the proper care of the breed, correct training methods and how to groom? If you've answered yes to all the questions above, best wishes on your new Golden! Now, it is time to read, Why a Golden is NOT the Perfect Family Dog. If you've answered no to several questions, dog ownership may not be for you. While dogs make great companions and friends, they require a level of responsibility that not everyone can achieve. Don't add to the number of dogs in animal shelters that will be euthanized because no one wants them. And, don't be inhumane by neglecting a dog's need for social interaction. This occurs when you keep Goldens constantly tied in the yard, or locked in a basement or garage due to behavior or housebreaking problems that could have been prevented! 1st Books to Read! — Dr. Ian Dunbar's, Before You Get Your Puppy, is the perfect way to get a good start before your puppy arrives. And his After You Get Your Puppy is unbelievable as well. Getting into the Right Mindset — These Golden ABC's are just the trick. And, getting over to our Fun and Motivational Dog Training page is a must. 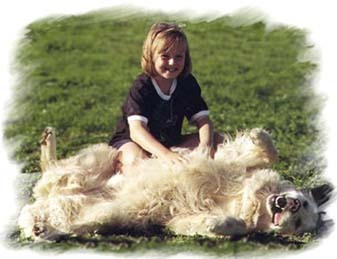 One of the friendliest and most lovable dog breeds, many people feel the Golden is the perfect dog. Some believe they may even be angels in disguise. Surely, they tempt you with their beauty. But, just as quickly, you are stunned by their determination and intelligence. Yet, it is their ability to read their human companion's thoughts and feelings that make them almost magical. Just look at Dakota with his 4-year-old brother Jared. So accepting. It is important to understand just what the Golden Retriever Standards are, as they tell us what this breed is supposed to look and act like. There are actually slightly different ideas about this very definition, as you will see here in the U.S., U.K. and Canadian standards. And, when looking for a breeder to find your Golden pup, it is very wise to GIVE YOUR BREEDER THE TEST first. Why do puppies sometimes lie on their backs when approached? Why do they sleep in a pile? Why do puppies have that special "puppy smell"? Why are some puppies runts? Few things can cause as much head scratching as the peculiar behavior and characteristics of a new puppy, and this book aims to answer all of the questions new dog owners wonder about their new little charge. 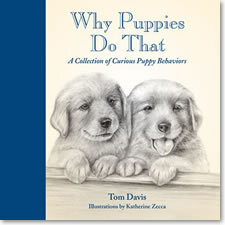 Illustrated with pencil drawings, Why Puppies Do That is lighthearted, informative, and as fun as a new puppy. About the Author: Tom Davis has been living with and writing about dogs for 30 years. He has written several Golden books and is an editor for several magazines including Sporting Classics and Pointing Dog Journal. Bonus gifts ($4+ value) with book purchase — glossy puppy stickers & an art illustration greeting card! Getting your very first Golden Retriever is an experience that stands alone. Listen to 17-year-old Kristen's story: "For starters, when I was five years old, I saw a Golden Retriever for the first time. Even though it was a huge dog at the time to me, I was head over heels in love. I walked over to the Golden, and when the owner saw the excitement in my eyes, he was generous enough to let me pet his beautiful animal. I extended my tiny fingers towards the Golden's powerful looking muzzle. Without taking a step, he stuck his nose in the air and sniffed my fingers, and then began wagging his tail as fast as it would go. I squealed with delight and amusement, at his behavior. And before I knew what I was doing, I wrapped my small arms around his body and gave him a hug. (Even though my arms wouldn't even go half way around his body.) He bent down and licked my face, until I was drenched in 'doggy slobber.' I'm sure to strangers passing by, we looked like a couple of old friends meeting for the first time in a long time. I felt that a magic moment pa ssed between us that we only knew about. (Like it was meant to be.) Right then his owner said, "I'm sorry little girl, but we have to go," and then to his dog, "C'mon big guy." That night, I cried and cried. Then an idea struck me, "Why couldn't I own a dog like that?" When I ran the idea by my parents, they said, "We're sorry, sweetheart, but we don't have a big enough house or yard for a dog like that. Your dog wouldn't be happy, and he wouldn't get enough exercise. Maybe in a few years." After waiting patiently, when I was in my 17th year, I finally received my Golden puppy this past Christmas. Max is now 6 months old, and he is the best thing that has ever happened to me. Now, I feel the emotion when someone says, "There is nothing, absolutely nothing, like a Golden RETRIEVER!" I have come to find out that my Golden isn't owned by me, but OWNS me. The day he owned me was when he stole my heart and looked up at me with those sparkling, brown eyes. (Now he shares my bed with me.)" According to information from An Introduction To The Golden Retriever by The Golden Retriever Club of America, puppies go through five critical periods. And, therefore, it is most important that they remain with their mother and littermates until 7½ to 8 weeks of age. During this time your puppy will learn about pack hierarchy, bite inhibition and proper social behavior within the pack. Taking a puppy home before this age can deprive the puppy of much needed training by mom and littermates and will make your job of training that much more difficult. During the first 3 weeks of life puppies have next to no mental capacity and their basic needs are provided by their mother. Little or no handling by humans is required (assuming all is well with mother and puppies). Around the 4th week puppies become aware of other living beings and have very slight trainability. This is an extremely critical period and puppies should not be removed from their mother or littermates. Introduction to humans should be started but carefully controlled. In weeks 5 through 7 they begin socialization within the litter and also with humans. At this point they are capable of responding to voices and to recognize people. Training by their mother is in progress and they are becoming aware of the differences between human and canine socialization. During the 8th through 12th week puppies are removed from littermates and mother. They require human socialization, love and security. Play with children should be well supervised. At this point they require a new mother image for security. It is also during this point that they develop man-dog relationship. They are also capable of learning simple training such as Come-Sit-Stay-No. 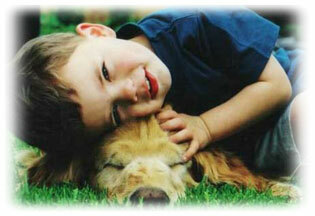 It is important that children or other animals not injure the puppy either accidentally or maliciously. Introduction to people is important but should be closely supervised. Gradually expose to loud noises such as autos, washing machine, vacuum, etc. At 13-16 weeks puppy's mental capacity is fully developed and needs experience. During this time puppy needs love, attention, socialization, discipline and security. Puppy will also try to establish itself as the dominant one. Your puppy is now capable of undergoing formal obedience training and can adopt a good or bad (positive or negative) attitude about training so please select your trainer with great care! Praise & reward for correct behavioral response will go a long way in training your Golden puppy! You will notice that your Golden does his fastest maturing in his first two years, already equal to a 15-year-old teenager after only one year. And, believe it or not, he or she is equal to an adult's age after only being with us two years. After that, however, only 4 years in maturity is gained with each passing year. Watch Dr. Yin with her dad's new puppy, Lucy, at 7.5 weeks of age. It's her first day at Dr. Yin's house. Lucy's already learned to sit for kibble. Now she is training her to sit to be petted (getting attention), and Dr. Yin is removing rewards for jumping. Then, she does the same thing with her own dog Jonesy around. Lucy correctly reads Jonesy's signals and backs down when Jonesy makes it clear he doesn't want her in his face. Please be sure to check out the many articles references above as well as these links below. That way, you can be sure to do right by your furry family members. Puppy Related Articles & MORE! Jean Donaldson: Talk Softly and Carry a Carrot or a Big Stick?